In early November, news spread across Jamaica that an election was going to be called soon. Despite the fact that constitutionally, the election did not need to held until sometime between December 29th, 2016, and April 17, 2017, then Prime Minister, Portia Simpson-Miller, hinted that it would be held in the near future. She was quoted in various newspapers saying that she was waiting for the word from God to call the election, and that she could feel that a victory for her party was around the corner. Photo credit: www.my-island-jamaica.com/jamaica-election-2016-as-it-happens.htmlJamaica has a two party system, although there do exist several minor parties as well. The two main parties are the People’s National Party (PNP), a social democratic party, and the Jamaican Labour Party (JLP), which, despite its name, is a conservative party. Based on public opinion polls, it appeared at that time that Simpson-Miller’s party, the People’s National Party, was still in the lead although steadily decreasing over the past few years. It is likely for this reason that the election was called so early. The election was called four weeks before voting day. In the weeks leading up to the election, there was tension in the air. There was a lot of campaigning. A constant stream of political ads could be heard on the radio. There were many rallies held, during which convoys of honking buses and cars filled the streets. Citizens could be seen hanging out vehicles sporting the respective party colours: orange, for the PNP, or green, for the JLP. On days when rallies were held, there were many visible supporters out – many of them wearing party colors or blowing horns. It was impressive to see so many people so politically engaged, and of all ages. 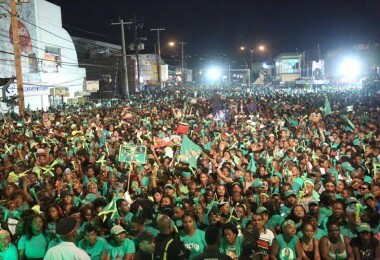 Photo credit: http://jamaicans.com/jamaica/culture-jamaica/On February 25th, 2016, a historically tight election was held – the PNP won 30 seats, and the JLP won 33 seats. I was surprised to hear that there was a very low voter turnout of hardly a third of eligible voters. The JLP campaigned on a platform of job creation, lowering taxes, economic growth, revitalizing cities and town across the island, and fixing water infrastructure. Many people with whom I spoke over the course of this election stated that they would not vote – not out of apathy, or because of a lack of information about the election, but out of a complete lack of faith that either party had their interests in mind at all. Over the next five years, hopefully disillusioned citizens who chose not to vote will have some faith restored in the possibility for a government to bring positive change. Grace Skahan is working with The Centre for Nursing Studies and FAMPLAN Jamaica.